BELTON – The University of Mary Hardin-Baylor men’s soccer team grabbed a 3-0 decision over Ozarks Friday afternoon in Belton. The win improved the Cru to 7-6-2 on the season and 4-2-2 in American Southwest Conference action while the Eagles fell to 8-7-2 on the season and 4-3-1 in conference play. Ben Hammonds gave the Cru a 1-0 lead with 30 seconds left in the first half off an assist from Oliver Ortiz. UMHB scored again in the 57th minute when Colby Case found the back of the net with an assist from Nate Fagnant. Julio Mar added another goal in the 85th minute, giving the Cru the 3-0 victory. Fagnant, Ortiz and Case Carnes led the Cru with three shots en route to a team-total 18. UMHB limited Ozarks to just five shots and no shots in the second half. Blake Landerearned the win for the Cru, making four saves in the shutout. 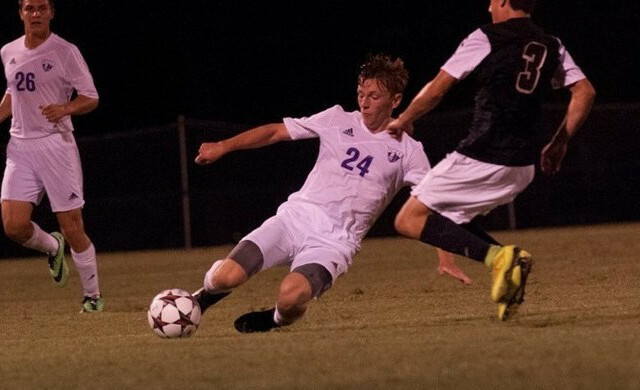 Austen Benner took the loss for Ozarks, allowing three goals. UMHB returns to action tomorrow in a 7 p.m. match against the University of Texas at Dallas. The Cru will honor the 2014 seniors prior to the contest.